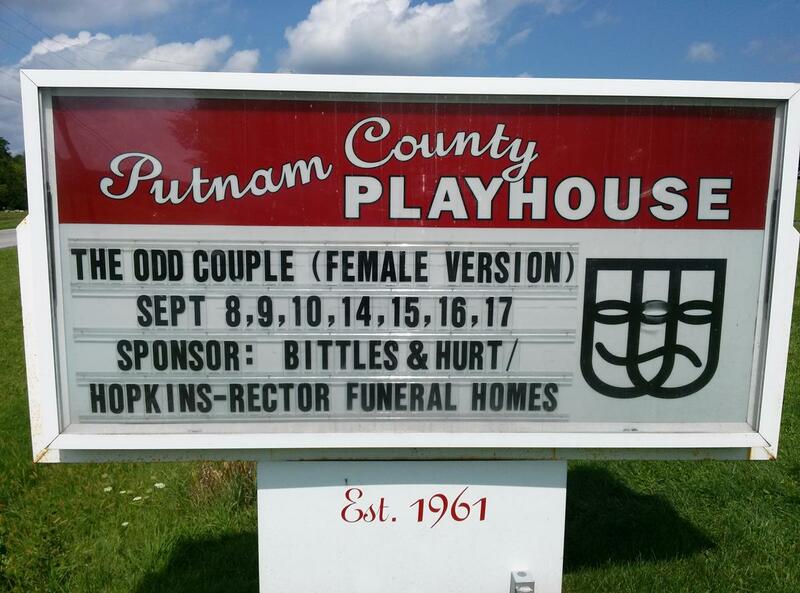 Putnam County Playhouse: "THE ODD COUPLE" OPENS ON SEPTEMBER 8!! The Odd Couple has ended its run. The 55th season of Putnam County Playhouse will close with a production of the Neil Simon comedy The Odd Couple (Female Version). L-R: Karen Bailey, Allison Creekmore, Meghan Armitage, Kathy Arnold, Sarah Bond, Katie Wallace. Read about our sponsors HERE and HERE. 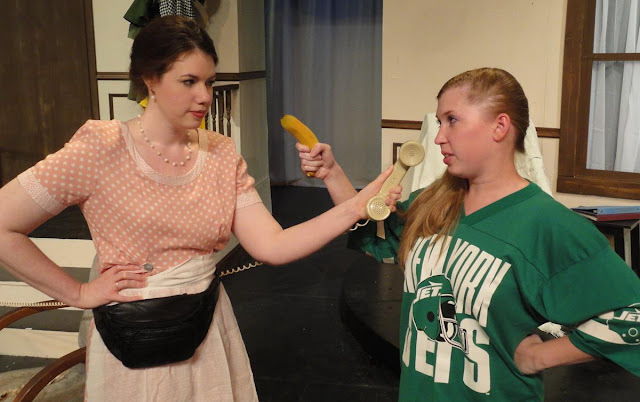 The show features Sarah Bond as Olive Madison and Meghan Armitage as Florence Unger. Their combined living arrangement causes conflicts familiar to anyone who has seen the original play, film, or television show. 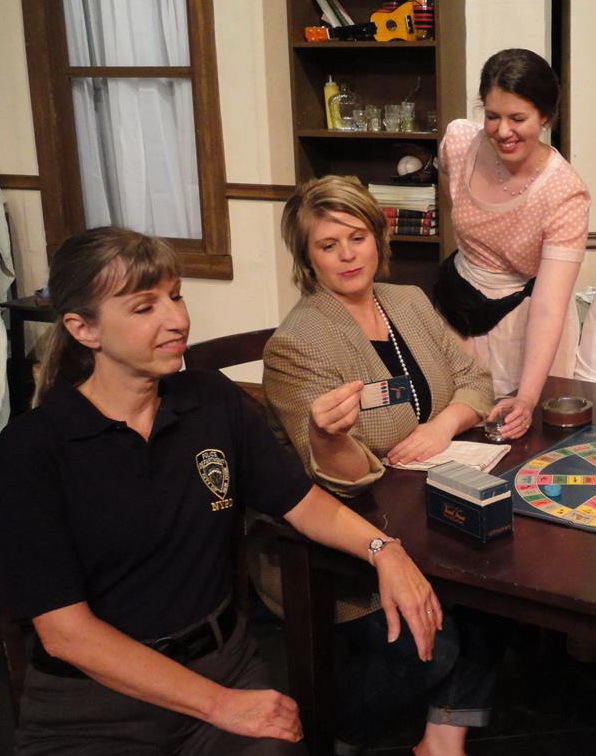 Florence (Armitage, R) interrupts the weekly Trivial Pursuit game of Mickey (Bailey, L) and Sylvie (Creekmore, C) with her coasters and cleaning. The comedy also highlights the relationship between the two women and their upstairs neighbors, the Costazuela brothers, Manolo and Jesús. These characters are played by Ric McFadden and Dustin Bond. Florence (Armitage) and Olive ( Bond) have reached an impasse. Friends of the leads are played by Kathy Arnold, Karen Bailey, Allison Creekmore, and Katie Wallace. Director for The Odd Couple is Andrew Ranck. Stage manager and props master is Jessica Masner. Set design is by Ranck and Linda Gjesvold. 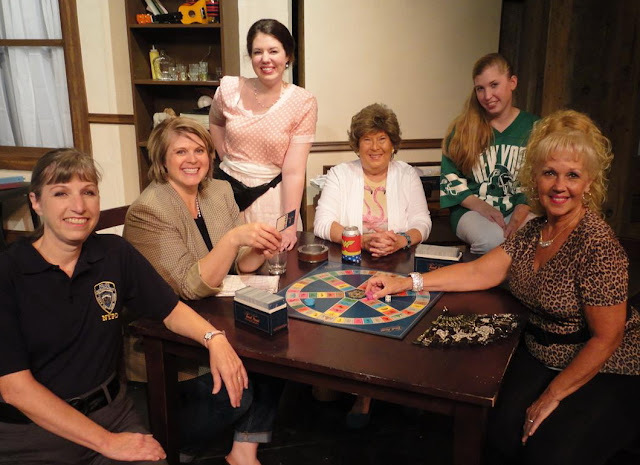 Vera (Arnold, L), Olive (Bond, C), and Renee (Wallace, R) play the game. Bailey and McFadden appeared in the play when it was first produced by PCPH in 1991. Bailey reprises her role as Mickey the Cop, and McFadden plays the other brother this time around. Costumer and wigmaster is Shelly McFadden. Set decorator is Aaron Swartz. Technical support is by Fiona Good running the light board and Cameron Wunderlich running the sound.